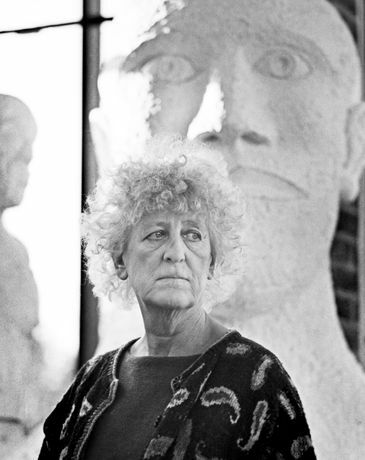 Dame Elisabeth Frink at her studio in Woolland, Dorset, March 1990. Copyright Anne Purkiss. An exhibition of portraits of sculptors by Anne Purkiss. The portraits in this exhibition were selected from an archive of photographs of British sculptors, taken mostly in the artists’ studios, over period of more than thirty years. Starting with portraits of artists whose work influenced the development of sculpture at the end of the 20th century, the larger part of the exhibition shows currently practising sculptors, members of the Royal Society of Sculptors and Royal Academicians as well as younger and emerging artists. Dame Elisabeth Frink (outdoors), Rana Begum, Simon Hitchens, Michael Lyons and Cathie Pilkington.